Prophecy Sign: The 'Image of the Beast"
There has been a good deal of recent discussion on many bible prophecy sites with regards to this question of Artificial Intelligence and if perhaps this rapidly emerging technology will ultimately play a huge role in the coming "Image of the Beast"
From the above passage of scripture we can determine that this future "Image" will be a creation of mankind, be a global entity, will have the ability to think for itself, will demand that humanity become part of a collective by worshiping a false God and accepting his mark in order to participate in daily commerce, and will have the ability to end the life of millions of people. From the articles below we know fast approaching is an Artificial Intelligence that will soon be consciously aware of itself. It will be global in nature and have the memory and intelligence to know nearly everything about every person on the planet. It will also be linked to every person that accepts an implant, (the Mark), which then can change a person into a Zombie like adherent of a new man-made religion complete with an A.I. Messiah, (the Image of the Beast). This conscious A.I. Messiah will be accepted by many due to the claims that it can and will solve all world problems. However, scientists are warning that this new self aware Artificial Intelligence would be a danger to all humanity with the ability to rebel against its' creator and eliminate much of mankind. Now tell us, does what bible prophecy warns of what is coming, and where current technology is quickly heading seem to be one and the same? Pretty scary stuff, and very much an indicator that we are definitely in the last of the Last Days. A religion based around a robot god will succeed because humans tend to 'worship supreme understanding', experts have claimed. 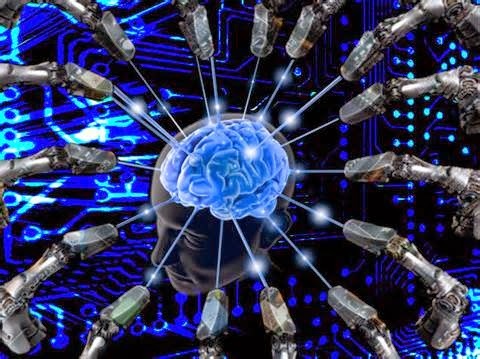 One researcher has said the same drive that compels people to believe in higher beings and follow religions will also work for so-called AI 'Godheads'. Others have commented that, like religion, people will eventually rely on a 'robot messiah' to solve society's problems. Forget about today's modest incremental advances in artificial intelligence, such as the increasing abilities of cars to drive themselves. Waiting in the wings might be a groundbreaking development: a machine that is aware of itself and its surroundings, and that could take in and process massive amounts of data in real time.